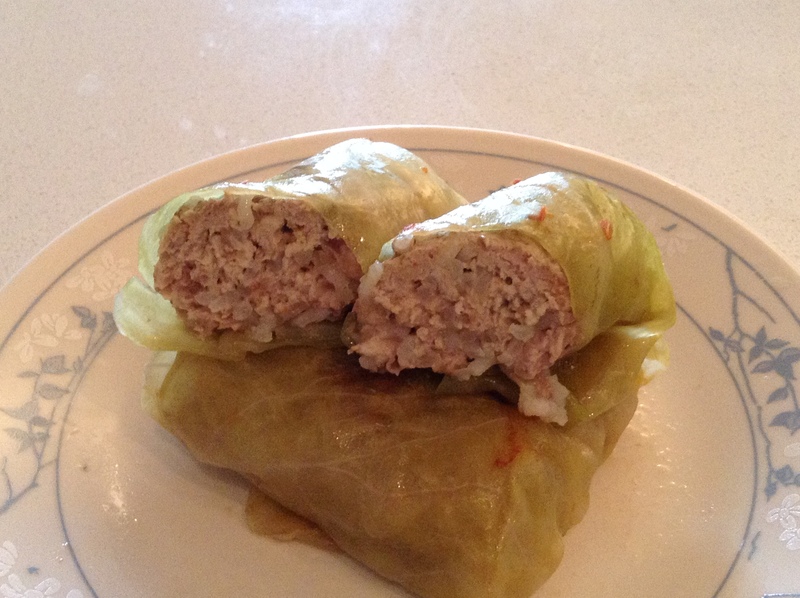 The recipe for Romanian cabbage rolls can be found at the bottom of this post. Please note that the following photos are simply of how I personally like to roll cabbage rolls. This may not necessarily be the proper or authentic technique. Keep in mind that the smaller the cabbage rolls, the tastier they will be. 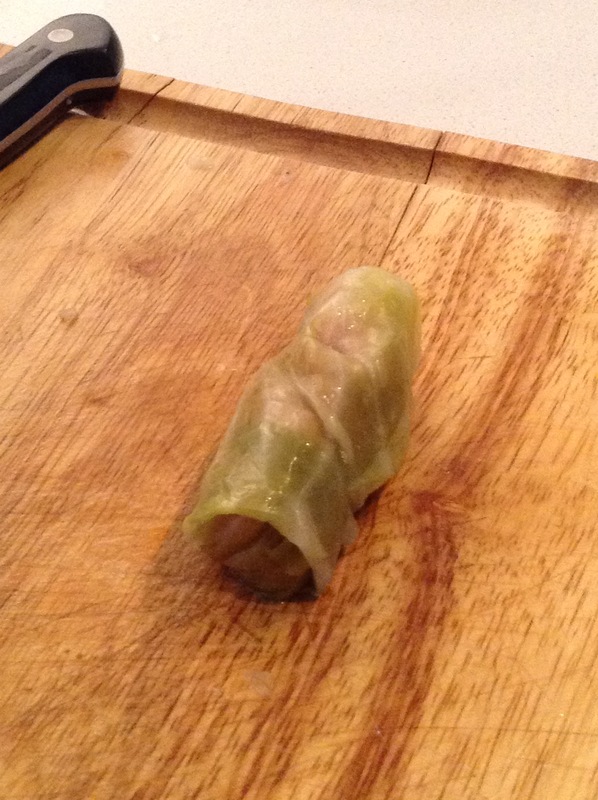 It doesn’t matter if your cabbage rolls are ugly, as long as the filling is sealed within the cabbage leaves. Use a thin, sharp knife to cut out the thick core of each of the cabbage leaves. Reserve the cores, as you will need them to line the bottoms of your pots. Then, depending on the size of the leaves, cut each leaf into 2, 3, or 4 separate pieces. The one shown in the photo below was large enough to be cut into 4 pieces. Roll one cabbage roll at a time. Take one piece of cabbage leaf and lay it flat on your work surface. Then place 1 to 2 tablespoons of the meat filling onto the cabbage leaf. Use your fingers to press the meat filling into a uniform log shape placed horizontally near the bottom of the cabbage leaf. Wrap the left and right sides of the cabbage leaf over the edges of the meat filling. 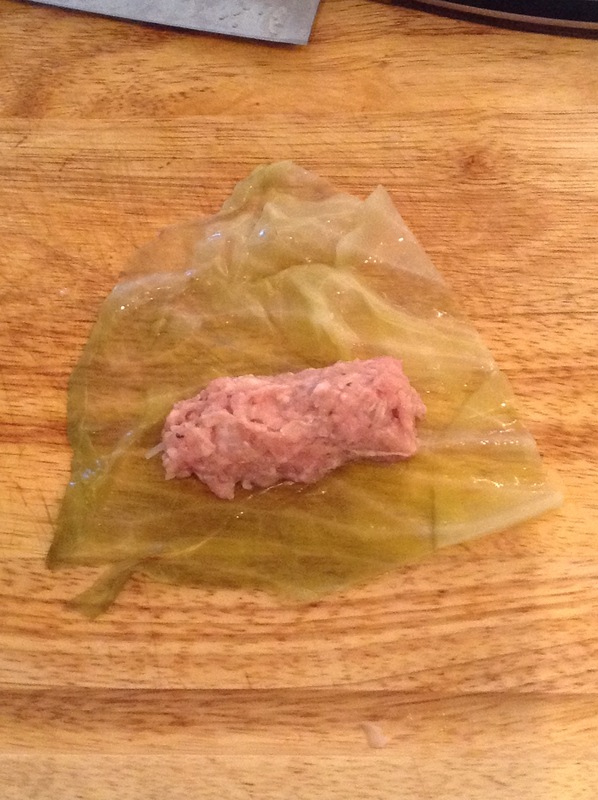 Then bring the bottom side of the cabbage leaf up and wrap it over the meat filling. Make sure that the cabbage leaf edges from the left and right sides are tucked in and that the meat filling is not able to leak out anywhere. (Alternatively, some people prefer to start by rolling the bottom side of the cabbage leaf up over the meat filling before folding in the left and right sides.) Then roll the cabbage roll all the way up the rest of the cabbage leaf. Place the cabbage roll into the cabbage-lined pot seam side down. Be sure to roll the cabbage roll as tightly as you can. If you are having difficulty containing the filling, then you are probably using too much of the meat mixture. adapted from Joana Sederias; Note: Make these at least one or two days prior to serving, as they will taste better over time. In a small saute pan, heat up a few drizzles of vegetable oil over medium to medium-high heat. Cook the minced onion until it is translucent and starting to brown. Then add the rice, stir to mix well, and remove from the heat. In a large bowl, mix together the ground meat, cooked onions and rice, black pepper, and 1 1/2 cups of water. (Note: The water helps to make the meat mixture less dense.) Set aside and prepare the cabbage leaves. Rinse the head of cabbage well under cool running water. Otherwise, it will be too salty. You can also soak it in cool water for a few minutes, if you’d like. Carefully separate the leaves of the head of cabbage. 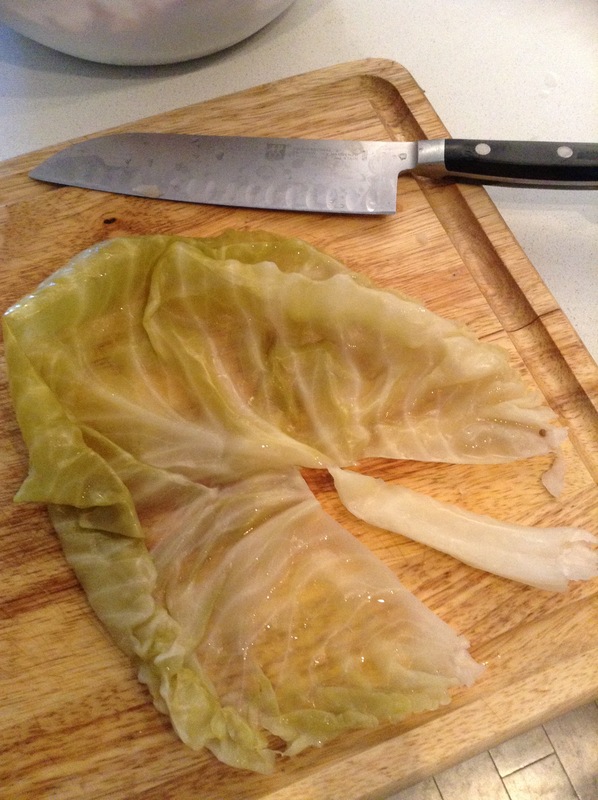 Using a sharp knife, cut out the tough core from each of the cabbage leaves. Finely chop all of the cabbage cores and use them to line the bottom of your pot(s). (Note: You will need one large or two medium sized pots for this recipe. The pot needs to be tall enough to hold two or three layers of the cabbage rolls. I have found that enamel cast-iron pots work best.) Then use the knife to cut the cabbage leaves, if necessary. Depending on the size of the leaf, you may cut them into 2, 3, or 4 pieces. The smaller the cabbage rolls are, the tastier they will be. Now you are ready to roll the cabbage rolls. Photo instructions have been provided above. Preheat the oven to 350 degrees F or 180 degrees C. Roll the cabbage rolls one at a time. Take one piece of cabbage leaf and lay it flat on your work surface. Then place 1 to 2 tablespoons of the meat filling onto the cabbage leaf. Use your fingers to press the meat filling into a uniform log shape placed horizontally near the bottom of the cabbage leaf. Wrap the left and right sides of the cabbage leaf over the edges of the meat filling. 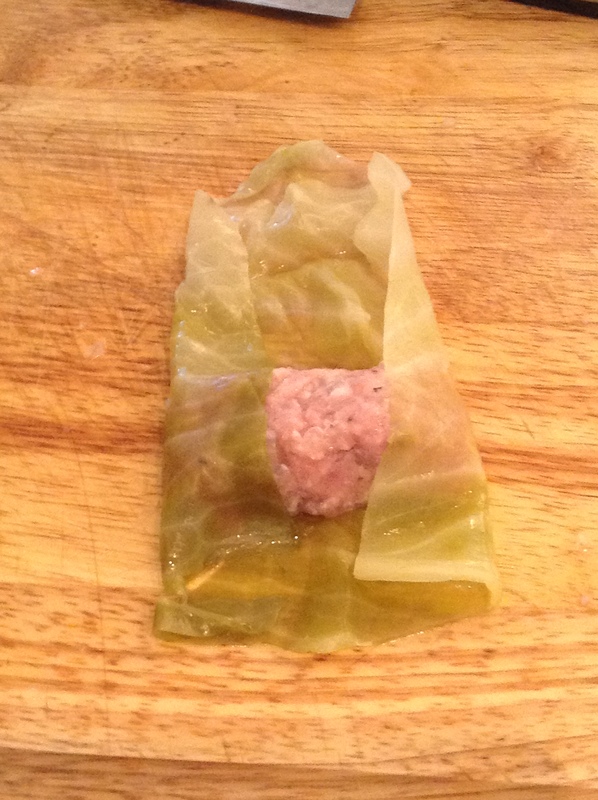 Then bring the bottom side of the cabbage leaf up and wrap it over the meat filling. Make sure that the cabbage leaf edges from the left and right sides are tucked in and that the meat filling is not able to leak out anywhere. (Alternatively, some people prefer to start by rolling the bottom side of the cabbage leaf up over the meat filling before folding in the left and right sides.) Then roll the cabbage roll all the way up the rest of the cabbage leaf. 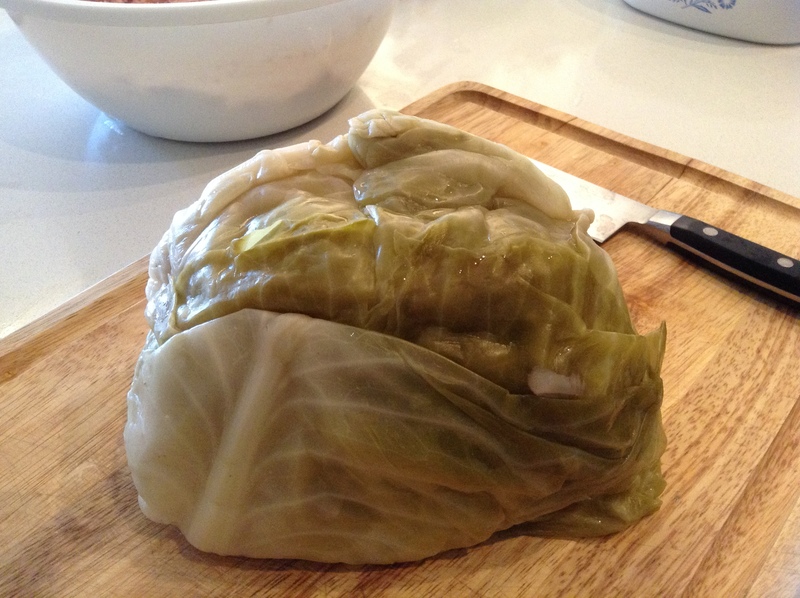 Place the cabbage roll into the cabbage-lined pot seam side down. Be sure to roll the cabbage roll as tightly as you can. If you are having difficulty containing the filling, then you are probably using too much of the meat mixture. Place the cabbage rolls along the bottom of your pots in a single layer. Try to line them up in the same direction, but be sure to fill in any gaps. Assuming that you are dividing your cabbage rolls over 2 pots and assuming that the pots are large enough that you only need to stack two layers of cabbage rolls in each pot: Scatter 1/4 of the smoked bacon pieces over the cabbage rolls. Then pour 1/4 of the pureed tomatoes over the cabbage rolls. Place a second layer of cabbage rolls into the pots, but, this time, try to orient them so that they are at a 90 degree angle to the first layer. Top the second layer with the same amount of smoked bacon and pureed tomatoes. Then, add enough water to each pot so that 3/4 of the height of the cabbage rolls is submersed in water. Cover the pots with the lids and bake them in the preheated oven for 1 1/2 hours. You may want to put a tray of water on the lowest rack of the oven to catch any overflow from the pots of cabbage rolls. This will prevent burning and smoking in your oven. At the end of the 1 1/2 baking time, ensure that there is still some liquid left in the pots, otherwise the cabbage rolls will burn. Add a little bit of water if necessary. Then bake them, uncovered, for 30 more minutes. Allow the cabbage rolls to cool completely before transferring them to the refrigerator to chill through. These will taste better over time, so try to resist serving them until at least one or two days after you make them. Serve cold or heated through with sour cream on the side. These cabbage rolls are freezer friendly. If you are going to freeze some, be sure to freeze them as soon as they have cooled completely. It is best to store these cabbage rolls in the remaining liquid and I don’t recommend using plastic containers.